Dhul Hijjah Food Challenge Results are in! Next year Insha’Allah, we can group the smaller classes together so that the competition is more balanced. Please share the results with all your respective teams! Jazakumullahu Khairan everyone for participating. The amount of food that we collected is so impressive Masha’Allah and has been a great source of help for so many people in need Alhamdulillah. May Allah accept all our good deeds and put barakah in all we do. Dhul Hijjah Food Challenge Starts Now! The Dhul Hijjah Food Challenge is a food drive which aims to utilize the first ten blessed days of Dhul Hijjah to raise food for people in need. The Prophet SAWS has said about these days, “There are no days in which righteous deeds are more beloved to Allah than these ten days…” (Bukhari). At the institute, we are doing this in the form of an inter-class competition where all classes will compete with each other to bring in the most amount of food. Each class will collect their food items in their respective classrooms. Donations are welcome from everyone in the community. Food contributions can be dropped off in the food bins at the institute (Food bin in the women’s area, and food bin at the Front Entrance). Let’s all join the race for good deeds and take this opportunity to help those in need. This Ramadan, we collected 340 food packages Alhamdulillah. We distributed food to seven food banks, to women’s shelters and transitional homes, and to local families. Thank you to everyone for your contributions! With your help, we were able to help people by providing food, not just in Ontario, but all over Canada. 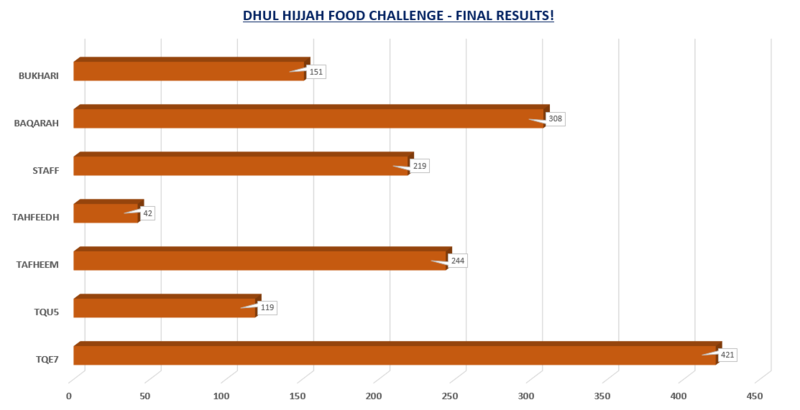 4th Annual Dhul Hijjah Food Challenge Results are in! This year’s Dhul Hijjah Food Challenge was very different in terms of the participating courses as our AHES students, boys Tahfidh classes and staff moved to a new location. With half of the building empty, our remaining staff and students were still determined to continue helping our neighbours in need. Our weekday TQE7 class commenced in August 2016 and the Dhul Hijjah Food Challenge was their first Serving Humanity project. They decided to form groups in their class and compete against each other to see which group could collect the most. The effect of this was phenomenal as each group raced to outdo each other in good deeds. Weekend classes TQE4 and TQU4 only had 1 day of class during the Dhul Hijjah Food Challenge due to the long weekend and Eid break. Despite this fact, TQU4 students brought in their donations early and TQE4 students brought in their food items and also raised funds used for purchasing oil and rice. Hifdh classes also participated and their dedication to bring in items on a daily basis could be seen from their enthusiastic teachers and students. Fiqh al Quloob students put in a good share of food donations and rose to the challenge. From the outreach venues our Etobicoke class happily participated in this year’s challenge as well. After the 10 day drive, the Al Huda community was able to collect 1,241 food items during this 4th #DhulHijjahFC! Congratulations TQE7 on your efforts and everyone who participated. Serving Humanity presents the 4th Annual Dhul Hijjah Food Challenge. Starting tomorrow, September 2, bring your non perishable food items to class at Al Huda to maximize your good deeds during these first ten days of Dhul Hijjah! 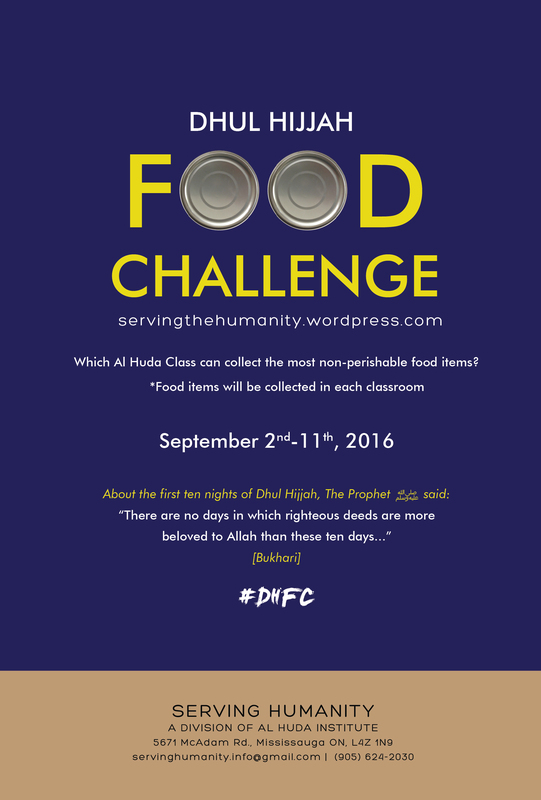 4th Annual Dhul Hijjah Food Challenge starts tomorrow!